When I sit down to scrap I usually start off with the story I want to tell. Next I pick some photos that will work to help tell that story. Having the photos decided helps me with the next stage which is all about choosing a colour scheme. 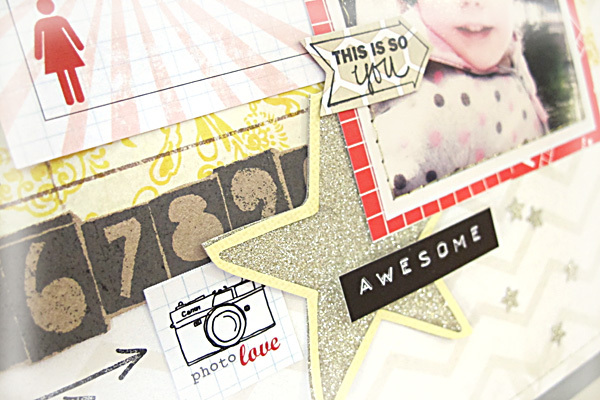 Only then comes the fun part about picking papers, alphas, journal cards and embellishments. So when I sat down (or rather stood) at my scrap desk on this occasion I had in mind that I wanted to share the story of my youngest daughters ideas on getting big. (Yes, I stand up to scrap... what do you do?) You see, she has it in her mind that she's not a 'big girl' until she's tall enough to touch the roof. It's a simple thing, but that's how she views the world right now. And that makes it significant enough for me to want to scrap it! Once I chose some photos I drew my colour scheme straight from the shirt she's wearing - grey, pink and black. I added some red highlights and turned some of that grey into silver sparkles as well. Turning to my Evalicious stash I was able to pick out some products that would work with the colour scheme. Like usual (for me) I knew I would need one of the journal cards to type all my journalling on and it would become quite a prominent feature on my layout, so I had to choose carefully. One of the cards from the Love You Lots 3x4 Tags was perfect. 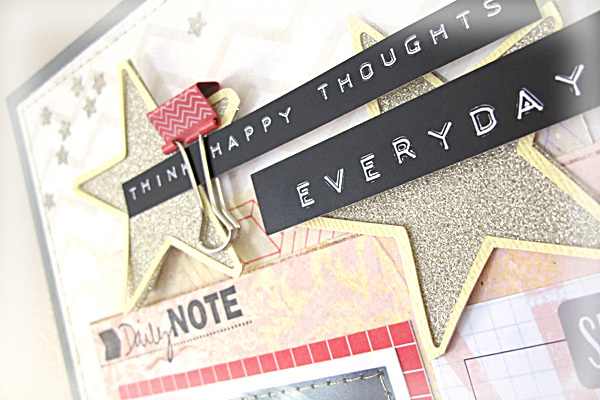 Sticking with the Love You Lots collection I also chose some Snipsnip Page Tabs and Miscellany Tags to use as embellishments. 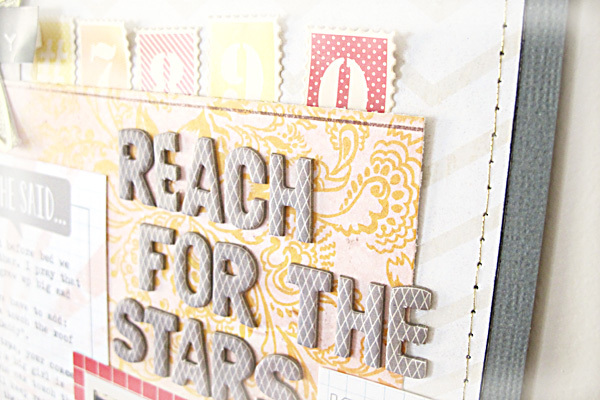 The last thing I always add to my layouts is some stamped details. I think they give the page the right finishing touch. 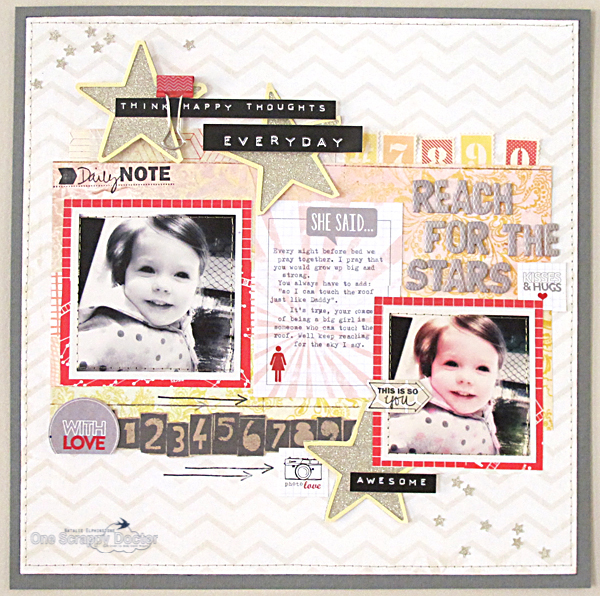 Here I used the Daily Note, Arrows and Words, and This is So You stamp with black ink to coordinate. I would love to hear back from some of our followers though.... what's your process when you scrap? Do you start with a story like I do, or do you choose photos first? Or something else entirely?